South Lake is a popular trailhead, so the overnight spots are usually full of backpackers’ cars. In the past, I have arrived at night and slept in a day-use spot without any problems. This time, however, I was awakened around 11 PM by a diesel engine and someone shining lights in car windows while saying something about overnight parking. At first I thought it might be a tow-truck, but it was only two men with a large diesel pickup. I ignored them, and they eventually went away, but I recognized several cars belonging to fellow Challengers pulling out of the lot and heading back down the road. Not wanting trouble, I did the same. I found out later that it was just some rednecks who wandered around a bit, defecated on someone’s windshield, and left. I reckon us furriners ain’t welcome. Anyways… today’s challenge peak was Sky Haven, the high point of a ridge north of the Palisades. After a fun walk along the rusty pipeline, we joined the trail past Brown and Green Lakes, then climbed the hillside to a high plain. While I stopped to apply sunscreen, Adam informed me that Bob had gone off to climb the Hunchback, a nondescript peak to the north. Naturally, I had to climb it as well. Eric and I reached the high point of the ridge to find a cairn and a register, and spied Bob inexplicably walking along the plain to the north. According to his map, the true Hunchback was a lower bump further along the ridge. That seemed strange to me, and I didn’t feel like walking out to the lower point, but being a nice guy, Bob credited me with the peak. After that, we headed a ways down the east side of the plain, then turned south across a sandy hill and up talus to the Sky Haven ridge. From there it was a long class 2-3 scramble to the high point, where we found a cairn and left a register. The views of the Palisades were spectacular as advertised, with a perfect angle to see both the east-west ridge from Sill to Thunderbolt and the north-south ridge from Sill to Middle Palisade. After waiting awhile, we returned along the ridge to find a group of people parked at an obviously lower bump on the ridge. It apparently coincided with a flag on Bob’s map, but given the Hunchback experience, I doubt they were truly on the summit. Much argument ensued, and a few continued on to the high point; the rest were either principled or lazy. Sky Haven alone would make an extremely short day, and I had already climbed the easiest bonus peaks, Cloudripper and Vagabond. I decided instead to climb Robinson, one of the few peaks in the area I had not yet climbed. 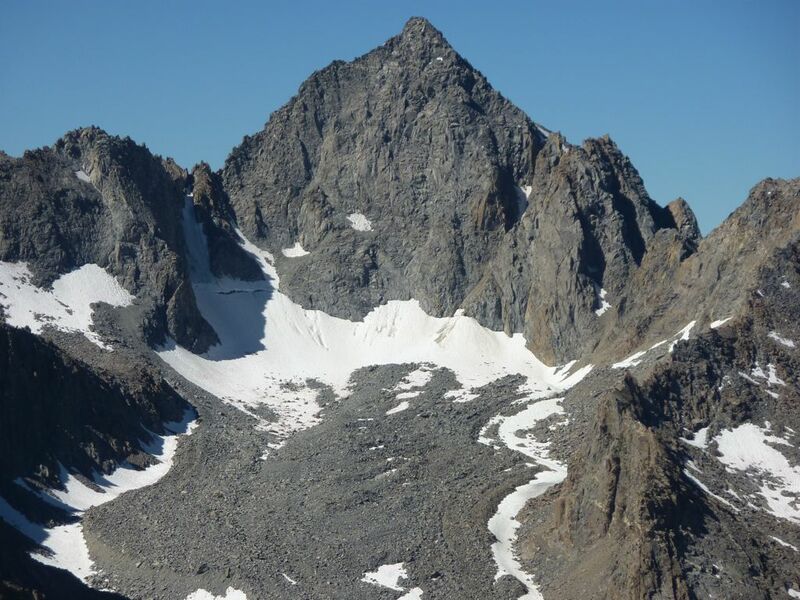 Ideally, I could return via Agassiz and Bishop Pass — according to Ron, the ridge beyond a certain notch was class 3-4. If that did not work, I could always drop down Jigsaw Pass. I dropped down some sand and talus to Nth (7th? 8th?) Lake, then made my way toward its class 3-4 northeast face. I passed a lone woman wandering slowly through the drainage to the north, but she didn’t look like she wanted to interact, so I walked on without acknowledging her. The face had a fair amount of loose dirt and rubble, but was solid underneath, and I reached the ridge without problems, only to find that the summit was a long traverse away. I slogged on to the high point, where I found a sort-of cairn, but no register. The view was nice, but not as good as from Sky Haven, since the Middle Pal ridge was hidden. The descent from Robinson to the Agassiz saddle was class 3 as described, with some deviations to the south. The ridge to Agassiz had a large subpeak before the gap, but it looked like I could bypass it on a class 4 ramp/chimney to the right. Unfortunately, this ended in a cliff on the northwest side of the subpeak. I was forced into some extended 4th class climbing up the face, which was mostly solid, but required careful climbing; a number of large blocks were loose or rotten. The ridge down the subpeak consisted of intricate 4th class climbing with a bit of easy 5th mixed in. The best and safest strategy was usually to stay on the crest, but some sharp drops required deviations to the south. Secor says Agassiz’s east ridge is 4th class, but this is only true if you access it at the gap via the glacier. Once past the gap, I made my exhausted way to the summit, where two men who had come up the class 2 route were enjoying themselves on a warm afternoon. I ate the last of my food, rested and talked for awhile, then bombed down the boulders and scree to Bishop Pass, stopping for water at a tarn. After a long, uneventful trail hike, I reached the car again after exactly 12 hours. Cloudripper, Vagabond, and Thunder-and-Lightning Lake. Sky Haven’s long summit ridge. The Palisades from Sky Haven. Robinson, with the NE face on the left. Difficult section of Agassiz’s east ridge. Agassiz from farther along the ridge.